I watched you on Saturday, in that little dance shop in Fort Worth, Texas, when the friendly, excited woman from somewhere up north slipped satin ballet shoes onto your feet. Your brow crinkled and you half smiled as you stood and tried make your way to the barre, oddly hindered by the strange, stiff shoes on your feet. Once you made it there, you stood, holding onto the barre lightly, in your pretty striped dress that makes you look so grown up and looked at yourself in the mirrors. You were finally wearing pointe shoes. The woman chattered happily as she checked the fit of the shoes. And, then something amazing happened. She stepped back and told you to go up on your toes. You didn’t hesitate. You immediately popped up onto the toes of those beautiful slippers, and you smiled at your reflection as you held the graceful pose. My heart fluttered inside me. I remember when you were in first grade and your school held a jump rope competition. You had no idea how to jump rope and you were eliminated in the first five minutes. That very day you came home and dug in your toy box until you found a jump rope I didn’t even know we owned. You took it outside and started practicing. You were determined that you would never again be caught off guard if the occasion called for jumping rope, and in a few months you had taught yourself all kinds of tricks. You spent the entire summer jumping rope all the way around our backyard, and the next year instead of a jump rope competition, they had a basketball shooting competition. You laughed and groaned and shook your head. At least I learned to jump rope, little second grade you said, wise and old in your glittery butterfly t-shirt. I sat there on Saturday, in that little dance shop, and I watched you at the barre. You looked so calm and determined, standing there impossibly on your toes. You reminded me of that little pigtailed girl who used to skip all over our yard with her jump rope flying. This week you started junior high school. You are already signing up for everything. I know you are the kind of girl who will run for every office and volunteer for every position. You are a leader. It’s scary for me to even type those words because I understand what it means. It means you have a mind of your own. It means you have a strong will (someday I’ll tell you all about the year you were three). It means that God may call you to do hard things. If you asked this world to define what a leader is, you would probably hear lots of talk about confidence and intelligence and following your heart. But, Christian leadership is about humility, confidence in Christ and His will, and following His word. See the differences there, sweet girl. If you are going to lead, and I believe you are, lead not from your heart (which the Bible tells us is deceitful and wicked) and not from a desire for recognition and achievement (the Bible tells us that the last will be first and the first will be last), but lead with the sense that God has uniquely gifted you with the desire to serve other people, to teach, to encourage, and to love. Lead knowing that it’s a great honor to represent Christ in all the different realms of your life–not just at church or among your Christian friends. Lead knowing that God may call you to do difficult things, scary things, amazing things. And, above all, lead knowing that He is the one who is really leading. I will never, throughout all eternity, forget the way you looked on Saturday, standing there in your easy way, perched on your toes like it’s an everyday occurrence. I can’t wait to see you fight to learn how to fly in those shoes, through lots of pain and struggle and determination. I know you will do it because I know you well. This is the strength that God has given you. The resolve, the stubbornness, the plain old guts to do things that you’re not completely sure you can do. I pray that God will prove to you over and over again that you can do all things through Him who gives you strength. Lead well, my girl, from the palm of His hand. And, don’t ever forget that every bit of the glory belongs to Christ, in your life, in mine, and in all corners of this earth and every galaxy beyond. To Him be the glory forever and ever. Today we went into a used movie store. It felt like stepping back into the 90s, like we were in Blockbuster again, perusing the shelves looking for the new releases. Those were the days. Chad had agreed to let the kids pick out a movie they had never seen. It was his little ploy to keep from having to take them to see Angry Birds, which isn’t exactly high on his non-existent list of must-see movies. In the end, the kids walked out happy, and we walked out with extra change in our pocket and two hours of our lives that we would have otherwise lost watching pigs and birds duke it out on the big screen. As we were walking to the car, Sawyer told me about seeing a big tub of bouncy balls in the store. He immediately walked over to it and grabbed one, of course. But, as he was happily bouncing the ball, he noticed a large black and white notice posted right above the tub: Do not play with these bouncy balls unless you intend to buy one. He told me about how he sheepishly put the ball back and quickly walked away. I’ve had a few experiences like that myself. But, the truth is, more often than not, I think of OTHER people who need to get the message. I hear a sermon that should be convicting me to my very core, but all I can think about is how I hope so-and-so is listening and taking note. I read scripture that should move me to repentance, but instead it makes me think of how someone else needs to repent. Way too often I have a sign hanging in clear black and white right in front of my face, and I think it applies to someone else, not me. I know I must make God sigh sometimes. The truth of His word is for me. It applies to me, just like that sign about bouncy balls exactly applied to Sawyer in that moment. I pray that I would see it so clearly like he did. And, I pray that seeing the truth leads to real repentance and humility. His word is true, and it’s talking directly to me, not just to all the people I think need to hear it. When I was four or five, my family lived in an old little rent house outside of town. We only lived there for maybe a year or two, but I have so many pleasant and amazingly clear memories of our time there. My brother and I shared a room, and I remember lying in our beds chatting in the dark just the way my own kids do now. At some point during that time, someone gave me a plastic Christmas snow globe. I remember that it had some trees in it. Maybe a little house. The snow was white and a little too large. The paint on the objects inside was slightly off. It had all the markings of one of those treasures of childhood that cost a dollar or less. Who knows where it had been or how many countries it had seen before it made it to my nightstand. I was fascinated by this snow globe. I would sit for what seemed like hours, shaking it, watching the snow fall. Something about it was just so peaceful and serene. A real pastoral scene, even with the garish, misplaced paint and the snowflakes that were a little too large. One day I noticed on the bottom of the snow globe there was a little plug. It was just a little piece of plastic, and it was designed to keep the water from leaking out of the globe. I pulled on it, and to my incredible surprise, the little piece popped right out. I sat there on my bed, shocked that I had figured out this secret opening that gave me access to the water and snow inside my globe. So, I did what I’m guessing any preschooler would have done. I drank some. Just a little bit. I just had a sip. Then I put the plug back in and I set my prized possession back on the nightstand. I waited a few days before I drank any more. I was really trying to forget that I had discovered that secret spot on the bottom of my beloved snow globe. After all, I felt fairly certain that my mama would NOT want me drinking out of it. And, I had plenty of other ways to get fresh water any time I wanted. Water that was clean, that didn’t come from who knows where, that didn’t have little white “snow” particles floating in it, made of who knows what. But, I couldn’t help myself. It seemed like the snow globe water just tasted better. It was so refreshing. I could sneak it at night when I was past the point of being allowed one more drink. Well, after a few weeks of sneaking snow globe drinks, I noticed that the water level in my globe was about half of what it was before. The snow that was left in there didn’t peacefully float around the house and the trees anymore. It just kind of collected on the top of the water and got stuck to the roof of the house. The serene little picture that the globe had once displayed looked kind of gross. Kind of not at all right. And, before long, I didn’t enjoy seeing it sitting on my nightstand anymore. The allure of looking at it had worn off. And, drinking out of it didn’t seem quite so tempting anymore. I’m not sure what happened to my half-full snow globe. I think I may have tried to add more water to it at some point, but it was never the same. I had ruined my prized possession by using it in a way that it was never intended to be used. And, the result was that I lost the joy that I once had for it. I suddenly remembered that snow globe today when I was chatting with my kids. I told them the story and they thought it was so hilarious that I was in my room chugging the water out of my snow globe. It is a funny and ridiculous thing for even a preschooler to do. But, I had to chuckle to myself later when I realized that we do the same thing to our churches. We get involved and we get all pumped about this beautiful experience of being part of the body of Christ. We are sure that we’re going to cherish and adore the church for the rest of our lives. We start trying to figure out the best way to be a good church member, the best way to dig in and really get invested in this thing, and for awhile it works. We really feel like we are serving. We feel like we’re running the race. We take on what we feel we are called to do, and we are in it for all the right reasons: for the glory of God. For the love of Christ. To serve each other. But, then we start feeling unappreciated. We want some recognition. It just looks so good in our minds, the thought of being praised for what we’re doing. We get proud of ourselves and we start feeling entitled to some respect. To some pats on the back. And, before we know it, there we are, drinking out of the snow globe. At first it tastes good, that desire for our own glory that keeps cropping up. But, pretty soon we have chugged enough of the bitterness that comes with pride that we have lost all joy for serving in the church. We feel slighted and used, and before long we are either resentfully serving, or we have quit altogether. But, there’s hope. It’s difficult for us to get ourselves out of a pit of bitterness and pride. In fact, it’s practically impossible. It’s like a little kid trying to replace “magical” snow globe water with regular old tap. But, if we want to return to a true love of serving in the church, if we long to go back to the days when living for Christ was a real joy, we can run to Him and ask Him to replace all of the bitterness that we swallowed and replace it with that beautiful picture that we once loved, of the body of Christ loving and serving together, and us doing our part for His glory alone. It’s really the only way, you know, when the church is shaken here and there, for us to remain beautiful. For us to shine like a prized snow globe on a preschooler’s nightstand. We have to put our own agenda, our own pride, our own desire for spotlights, awards, and glory aside. And, we have to serve from a deep love for our Lord. After all, serving Him in humility is the very least we can do for a King who made Himself a servant for our sake. The truth is, that Adelade is a unique personality. Because she is the one and only Adelade. God never made another soul exactly like her, and He never intended for her to fit into some cookie cutter shape of what a girl, what a Christian, what an artist, what a singer, what a softball player, what a deep thinker, what a giggler, what a writer, what a big sister, what a daughter, what a Child of God ought to be. He made her to be something else entirely. Something exclusively her. And, He made each of our children the same way. Yours, too. To be quirky and have wacky ideas and come up with brilliant ways of looking at things that no one else would think of. Yet, we spend so much time as parents trying to push our children into the constricting mold of popularity. For some of us, our entire child-rearing experience is spent bowed at the idol of what-makes-my-kid-cool. We’re more concerned with what brand of clothes they’re wearing than with what their spiritual condition is. We want to see our daughters become cheerleaders and drill team captains more than we want to see them brokenhearted for the lost. We would rather know that our sons are being voted Prom King and have a long line of girls waiting to date them than to see them include outcast kids who have no one. We would honestly rather see our children become the world’s kind of successful than to see them on the fringes, living a life radically devoted to Jesus Christ. We do this in small ways. We see their zealous, wild heart for Jesus from a young age. And, we smile because it’s heart-warming and cute. But, then we send messages that what’s more important than that is having loads of friends and being voted most likely to everything and being the pretty one. We have lived at the altar of popularity for so long that we don’t even realize that in our hearts this is our real wish for our children: fitting into a world that hates God and tries at every turn to downplay the Truth. We must stop this. We must instill in our children the firm knowledge that nothing matters more than Christ. Nothing counts for much of anything unless it glorifies His name. And, if we live this in front of our children, if we teach them what is truly important, if we help them build their unique, special, weird little lives on the foundation of Jesus-is-all, then if they are voted most likely to everything, then they will view the honor with a proper perspective that lifts Him high and makes them humble. And, if we make it clear to them that honoring Him is what life is about, then if they are never voted anything, if they are far from popular, they will also have a better time viewing that from the best perspective: His opinion of us is really the only one that matters. There’s nothing wrong with cheerleading or drill team or designer clothes or prom dates. But, when we turn these things into ultimate goals of life for our children, we are leading them down a path that will be hard for them to get off of. And, before we know it we’ll have adult children who are marginal Christians, more interested in buying a bigger house and joining a country club than in using their unique gifts to bring glory to Jesus. Now that Adelade is ten, I don’t know if she still thinks she’s weird. She is starting to get into brands. She is looking forward to playing an instrument in band next year. 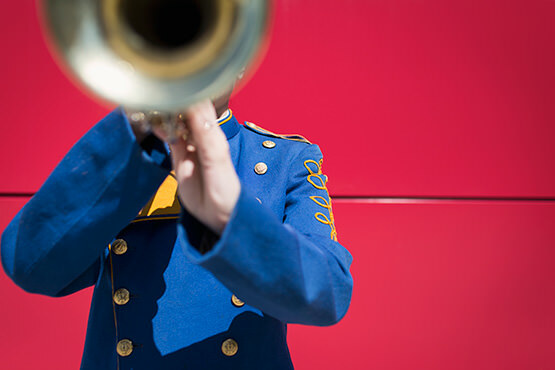 Right now she is leaning toward trombone. She is still a brilliant little artist and recently revealed a somewhat incredible ability to sing harmony on the spot. She’s a ponytail addict. She has friends. She reads several books a week. I am so glad she’s mine. And His. I pray that she will serve Jesus Christ in all the ways that He has uniquely created her to do so, never bowing at the altar of popularity. It’s a cold and fickle god. She will only find hope and purpose and confidence in living for Christ. Prom crowns fade and cheerleading suits get tight around the middle, but a woman who fears the Lord is to be praised. In her two year old way, Emerald wanted us to know that, even though she had a real problem with how her sister was acting, she still believes that Adelade is a pretty nice girl. It made me think of the old adage “Hate the sin/Love the sinner.” Emerald has her own special ways of wreaking havoc that drive her big sister crazy. But, I really don’t see evidence, in her little-ness, that she hates her own behavior too much. No, she seems pretty okay with the fact that she does things she shouldn’t. But, when she sees misbehavior in someone else, watch out, because she will call them out on it. In love, of course. I’m of the belief that we should call each other out on sin. I think we should love each other deeply and hold each other accountable. I think we should speak loving truth to one another. And, yes, I think we should hate sin. But, the problem I have with the often-quoted old saying is the misconception that we are to love sinners and hate THEIR sin. The truth is that we need to love sinners and hate ALL sin, especially our own. It’s our own sin problems that should keep us up at night, not what we see happening in Hollywood or what we read in the newspaper. Knowledge of our own sin should be breaking our hearts and bringing humility and understanding. When we stand face-to-face in brutal honesty with our own sin issues, when we take a good, long hard look in the mirror, this is when true love for our fellow sinners comes about. This is when we can honestly say, no, don’t take that path. I know where it leads. It has broken my heart, and I don’t want it to break yours, too. 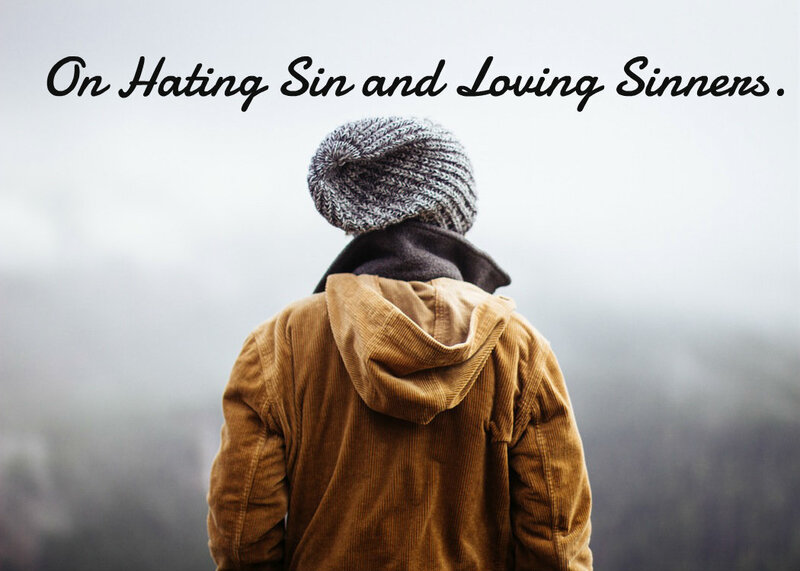 When we hate sin, we should hate ours first. We should be brought low by it. It should cause us to bow before a holy God, acknowledging our unworthiness. And, it should make us rise again with the knowledge that it’s only by God’s grace and mercy that we ever take a right step. Then, each day, when we have met our own sin and have set out to conquer it in the name of Jesus, we can greet others along the road and love them. Really love them. Because we will feel desperate to warn them about what sin really does to the heart and the soul. It’s an unusual call to worship: dwell on the depths of your own sin. Let yourself be humbled by God’s goodness. Hate sin. Love sinners.